ကညီကရၢမံၣ်နံၣ်စိထၣ်ဟ့ၣ်နီၤလီၤတၢ်သိၣ်လိဘၣ်ဃးတၢ်အိၣ်ဆူၣ်အိၣ်ချ့ဆူပှၤဘၣ်ကီဘၣ်ခဲသ့ၣ်တဖၣ်အအိၣ်ဒီးမၤစၢၤပှၤဘၣ်ကီဘၣ်ခဲသ့ၣ်တဖၣ် ဒ်သိးကဒိးန့ၢ်ဘၣ်တၢ်အိၣ်ဆူၣ်အိၣ်ချ့တၢ်ကွၢ်ထွဲမၤစၢၤအဂီၢ်န့ၣ်လီၤ. ကညီကရၢမံၣ် နံၣ်စိ ထၣ်မၤသကိးတၢ်ဒီးတၢ်ကရၢကရိအါဖု ဒ်သိး ကဟ့ၣ်နီၤလီၤတၢ်အိၣ်ဆူၣ်အိၣ် ချ့တၢ်သိၣ်လိလၢအဖိးမံလိာ်သးဒီးတၢ်ဆဲးတၢ်လၤ ဒီးဒုးအိၣ်ထီၣ်တၢ်အိၣ်ဖှိၣ်တဲသကိး တၢ်တဖၣ်န့ၣ်လီၤ. ကညီကရၢမံၣ်နံၣ်စိထၣ်နုာ်လီၤမၤသကိးဒီး (MNsure) လၢတၢ်ယူၢ်ဃီၤဒုးဘၣ်ထွဲသးဒီးကမျၢၢ် တၢ်ဖံးတၢ်မၤ (outreach) ဒီးတၢ်ဆဲးလီၤမံၤဒ်သိးဟံၣ်ဖိဃီဖိသ့ၣ်တဖၣ်ကမၤန့ၢ် တၢ်အိၣ်ဆူၣ်အိၣ်ချ့အလံာ်အုၣ်ကီၤ သးအဂီၢ် ဒီးဟံးစုနဲၣ်ကျဲဘၣ်ဃးတၢ်အိၣ်ဆူၣ်အိၣ်ချ့တၢ်တိာ်ကျဲၤတဖၣ် ဒီးတၢ်ဆဲးလီၤ မံၤလၢတၢ်ဆါဟံၣ်တဖျၢၣ်ဖျၢၣ်အဂီၢ်န့ၣ်လီၤ. ကညီဖိတၢ်ပူၤဖျဲးလၢညါသူးတၢ်ရဲၣ်တၢ်ကျဲၤ (Karen Tobacco-Free Program) အိၣ်ဒီးတၢ်ယူၢ်ဃီၤ ဒုးဘၣ်ထွဲသးဒီး ကမျၢၢ် (outreach), ဟ့ၣ်နီၤလီၤတၢ်သိၣ်လိဒီးတၢ်တဲဖျါထီၣ်တၢ် (advocacy) ဒ်သိးကမၤလီၤစှၤတၢ်စူးကါညါသူးလၢ ပှၤကညီတဝၢပူၤအဂီၢ်န့ၣ်လီၤ. ကရူၢ်လၢမၤသကိးတၢ်ဒီးကညီဖိလၢသူကသံၣ်မူၤဘှီးဒီးသံးဧိၤဂာ်ဧိၤသ့ၣ်တဖၣ်န့ၣ် (Karen Tobacco-Free Program) ဟ့ၣ်နီၤလီၤတၢ်ကူစါယါဘျါလၢဘၣ်လိာ်ဖိးမံဒီးတၢ်ဆဲးတၢ်လၤ ဆူပှၤဘၣ်ကီဘၣ်ခဲလၢ အဘၣ်ကွၢ်ဆၢၣ်မဲာ်ဒီး တၢ်သူကသံၣ်မူၤဘှီးဒီးတၢ်အီသံးအီဂာ်သ့ၣ်တဖၣ်န့ၣ်လီၤ. တၢ်တိာ်ကျဲၤဘၣ်ဃးတၢ်မၤလီၤမၢ်ကွံာ်တၢ်အိၣ်ဆူၣ်အိၣ်ချ့တၢ်တဃူဃီၤလိာ်သး (Eliminating Health Disparities Initiative) န့ၣ်အိၣ်ဒီးတၢ်ဟ့ၣ်လီၤသးလၢ ကမၤလီၤစှၤဒီး ဒီသဒၢ သးတၢ်ဆိကမိၣ်တဘၣ်လိာ်ဘၣ်စးတၢ်ဆါ ဒီးတၢ်သူတၢ်စုဆူၣ်ခီၣ်တကးလၢပှၤကညီတဝၢပူၤအဂီၢ်န့ၣ်လီၤ. ကညီဟံၣ်ဖိဃီဖိတၢ်တိာ်ကျဲၤဘၣ်ဃးတၢ်အိၣ်ဖိအိၣ်လံၤ (Karen Family Planning Program) န့ၣ်အိၣ်ဒီးတၢ်ဟ့ၣ်လီၤသးလၢ တၢ်သိၣ်လိကညီပိာ်မုၣ်ပိာ်မၢၤတဖၣ်ဘၣ်ဃးတၢ်ဒုး လီၤစၢၤလီၤသွဲၣ်အတၢ်အိၣ်ဆူၣ်အိၣ်ချ့န့ၣ်လီၤ. KOM conducts health education with refugees and helps refugees access health care. KOM partners with various agencies to provide culturally appropriate health trainings and workshops. KOM also participates in MNsure outreach and enrollment to assist families to better access and navigate health plans and establish primary care providers. The Karen Tobacco-Free Program conducts outreach, education and advocacy to reduce tobacco use in the Karen community. 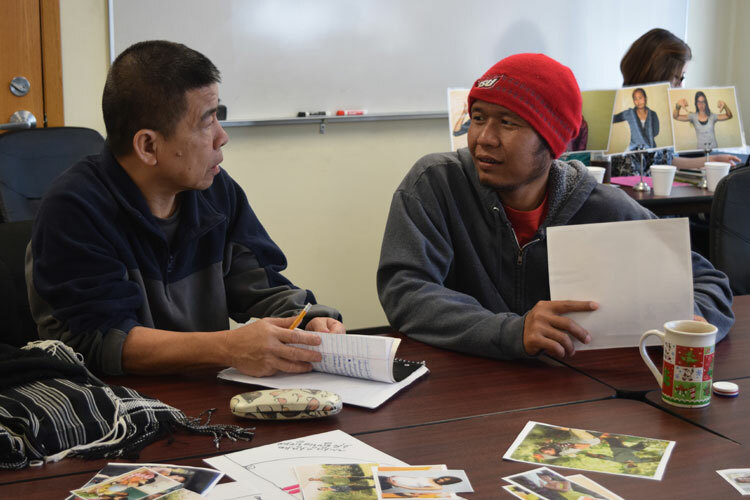 The Karen Chemical Dependency Collaborative provides culturally-specific treatment for refugees who suffer from alcohol abuse. The Mental Health and Family Relationships Program is committed to reducing and preventing mental health issues and violence in the Karen community. The Karen Family Planning Program is committed to teaching Karen men and women about reproductive health. To learn more about KOM’s Community Health programs and services, contact Moses Moe, Community Health Program Manager.